Star Wars: The Old Republic game update 5.4 “Crisis on Umbara” launching August 22! Prepare to lead the ultimate covert assault: battle your way across a moving train, brave the wilds of a dark new world, and more in a high-stakes new Flashpoint! When a deadly traitor is tracked to the shadow-world of Umbara, you’ll need to lead a strike team to confront the betrayer before the galaxy is thrown back into war. With multiple challenge modes available, you can choose to experience the new storyline with your Companions, or fight alongside up to three friends to earn legendary rewards! Once you’ve uncovered the traitor, expand your command with a new Stronghold, the Umbara Mobile Base! For the first time, personalize your very own moving train and enjoy the sights as the shadow world’s eerie landscape passes by. Take a closer look at the new Flashpoint and Stronghold in the [Crisis on Umbara: Gameplay and Rewards Blog], and learn more about the new planet of Umbara in our short story, [Trading Scars]. 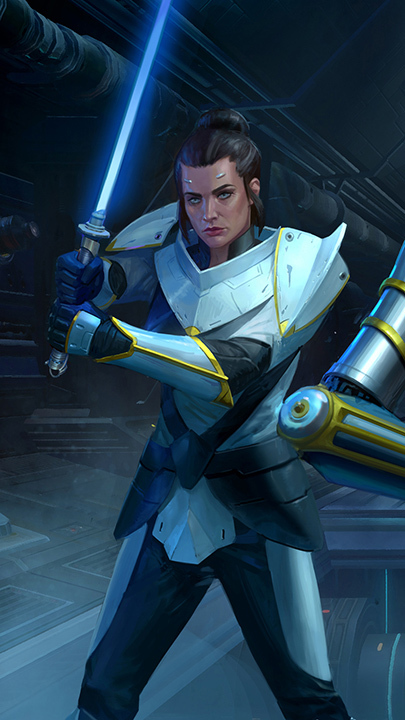 ‘Crisis on Umbara’ also introduces exciting new customization options for Senya Tirall, plus new Class combat updates, quality of life improvements, and more! See the full list of updates in the [Patch Notes]. The traitor seeking an early end to your reign has been tracked to [Umbara]! Can you hijack a moving train and confront the betrayer before they escape? 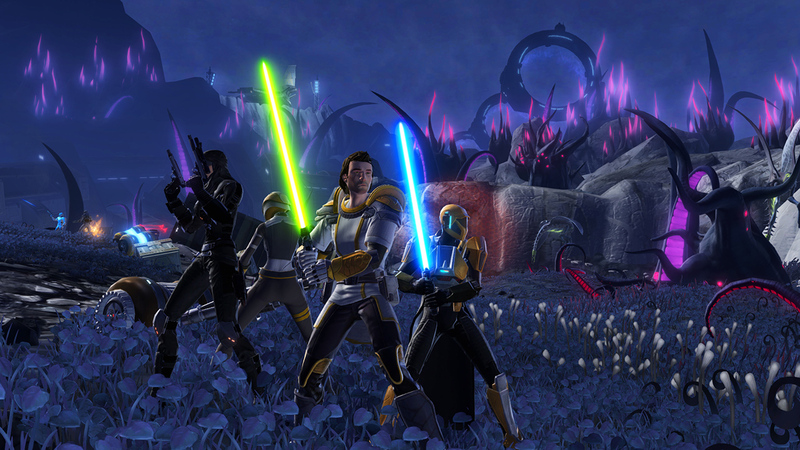 Play with your Companions in Story Mode to continue the storyline where you left off in the ‘War for Iokath’. Or, fight with up to three friends and choose from [multiple challenge levels]: Story, Veteran, and Master Mode. Earn the keys to a new home, the Umbara Mobile Base! 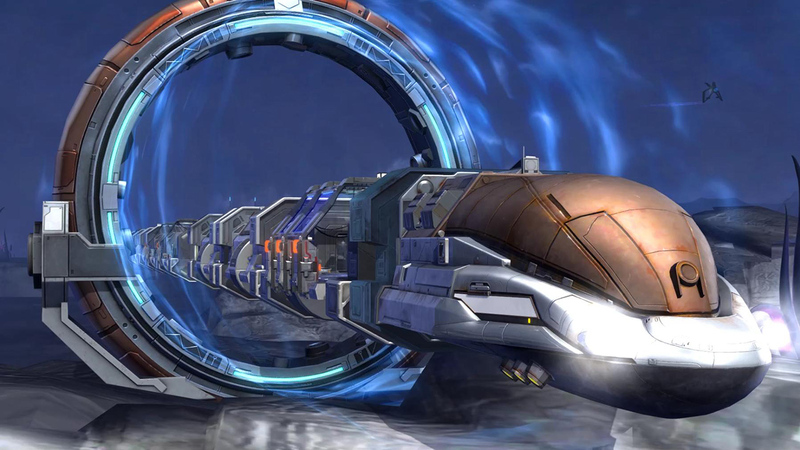 Customize your very own moving train – the same type featured in the new Flashpoint, Crisis on Umbara. Unlock the Umbara Mobile Base by earning [Alliance Recon Data] from the new Flashpoint, or by cashing in your Credits or [Cartel Coins]. For the first time, customize the outfit of the legendary Zakuulan Knight, Senya Tirall!! Looking to blend into the crowds with more traditional attire? Heading into a firefight and need something more battle-resistant? Now you can hand-select any armor or outfit for Senya! Unlock exotic Umbara-themed gear in the newest Cartel Market Pack! Tame two of Umbara’s most feared beasts, the wild Mantorr and Slybex! Personalize your new Mobile Base Stronghold with Umbara-themed Decorations! Customize your blasters, Lightsabers, and more with the Umbara-inspired visuals of the Indigo Fog Weapon Tuning! BE A PREMIUM PLAYER – GET ULTIMATE ACCESS! Enjoy unlimited access to the new Galactic Command system unlocked at Level 70 as you fight to grow your power and retain control of the galaxy in ongoing battles and Uprisings – alone or with friends – to earn the most valuable rewards. Receive 500 FREE monthly Cartel Coins to trade in for gear, XP Boosts, speeders and more! Must be a Premium player (subscriber status) as of December 2, 2016 to play Knights of the Eternal Throne. CHAPTER 1WRATH AND RUINLead the Alliance in an explosive battle against Empress Vaylin and the Eternal Empire. CHAPTER 2RUN FOR THE SHADOWSFace powerful assassins and join forces with an unlikely NEW ally. CHAPTER 3DARK REUNIONSConfront old rivals in an epic showdown to safeguard the Alliance. CHAPTER 4WHERE DREAMS DIEDiscover a mysterious and deadly new world a bold fight for survival. CHAPTER 5ASCENSIONBattle to escape destruction with help from an OLD ally. CHAPTER 6THE DRAGON’S MAWSpearhead a daring undercover mission to infiltrate enemy territory. CHAPTER 7INTO THE VOIDHunt your enemies in a dangerous and forgotten world to discover dark secrets. CHAPTER 8END TIMESLead your Alliance against the greatest threat it’s ever faced. CHAPTER 9THE ETERNAL THRONEClash with the Eternal Empire’s strongest forces as you battle for control of the Eternal Throne to influence the galaxy for the light or dark side of the Force™.